As we mentioned a few weeks back, the new user agreement for eBay includes one of those lovely little clauses that takes away customers’ right to a lawsuit against the company and locks them into mandatory binding arbitration. Fortunately, it also includes the ability to opt out of that clause, but you have to do it in the form of an actual letter, which has to be postmarked by Nov. 9. You can choose to reject this Agreement to Arbitrate (“opt-out”) by mailing us a written opt-out notice (“Opt-Out Notice”). 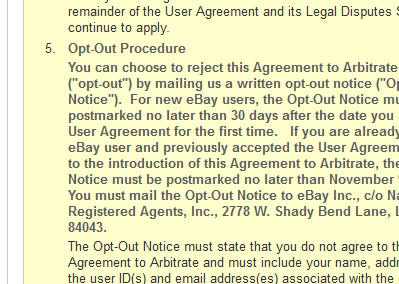 For new eBay users, the Opt-Out Notice must be postmarked no later than 30 days after the date you accept the User Agreement for the first time. If you are already a current eBay user and previously accepted the User Agreement prior to the introduction of this Agreement to Arbitrate, the Opt-Out Notice must be postmarked no later than November 9, 2012. You must mail the Opt-Out Notice to eBay Inc., c/o National Registered Agents, Inc., 2778 W. Shady Bend Lane, Lehi, UT 84043. Citizen.org has templates [PDF and Word] that should allow you to fill in the blanks properly so that your opt-out letter is not rejected. You can also tell eBay how you feel about the mandatory arbitration nonsense, by adding your name to this letter from Public Citizen to the online auction site, asking it to re-think its change to the user agreement. Although forced arbitration provisions and class action prohibitions are increasingly commonplace in consumer contracts, they are fundamentally unfair to users/consumers, who are denied the protections of the civil justice system, effectively denied redress for small- and medium-dollar disputes, and forced to bring cases before arbitrators too often biased in favor of repeat-player defendants. We therefore urge you to modify your user terms of service to remove the Agreement to Arbitrate. Even an easily exercised opt-out option — which you are not providing — is an inadequate cure to a forced arbitration contractual requirement. The vast majority of users accept standard-form contract language without reviewing or analyzing it; and, most users have no way to appreciate the consequences of agreeing to forced arbitration provisions. It is appropriate for eBay and a user to agree to arbitrate disputes, but that decision should be made after a dispute has arisen, when a consumer is in position to make a reasonable assessment of the benefits and disadvantages of arbitration. The use of mandatory binding arbitration clauses has skyrocketed since the 2011 U.S. Supreme Court ruling in favor of AT&T, which had argued that the inclusion of a tiny little arbitration clause in a massive contract that no one ever reads was sufficient for nullifying customers’ right to join together in a class-action lawsuit. Instead, each individual customer must go through the prescribed arbitration process.